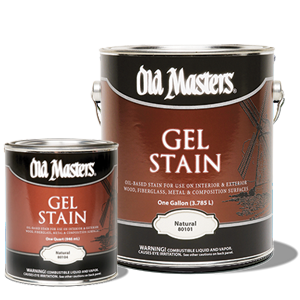 Old Masters® Gel Stain is a highly pigmented, oil-based stain designed to achieve intense colors on interior and exterior wood, fiberglass, metal and composition surfaces. SURFACE PREPARATION: All surfaces must be clean, dry and free from dirt, wax, grease, glue and other contaminants or penetration and adhesion will be affected. Wood surfaces must be sanded smooth. Remove dust with a tack rag or a lint-free cloth dampened with mineral spirits. Surface defects should be repaired with an appropriate patching material. WARNING! If you scrape, sand or remove old paint, you may release lead dust. LEAD IS TOXIC. EXPOSURE TO LEAD DUST CAN CAUSE SERIOUS ILLNESS, SUCH AS BRAIN DAMAGE, ESPECIALLY IN CHILDREN. PREGNANT WOMEN SHOULD ALSO AVOID EXPOSURE. Wear a NIOSH approved respirator to control lead exposure. Clean up carefully with a HEPA vacuum and a wet mop. Before you start, find out how to protect yourself and your family by contacting the National Lead Information Hotline at 1-800-424-LEAD or log on to www.epa.gov/lead. APPLICATION: Stain application varies based on surface material. Please see application instructions below. Application over Painted Surfaces: To create a simulated wood look, apply stain to painted sur- face with foam or bristle brush or cheesecloth using long, smooth strokes. Realistic woodgrain patterns can be created by using the Old Masters® Woodgraining Tool, as illustrated in the Old Masters® Woodgraining Booklet. Application over Previously Finished Surfaces: Scuff sand surface before application. Remove dust. Apply a liberal coat of Gel Stain with a firm synthetic brush or lint-free rag and work the stain across and into the grain uniformly, feathering out streaks while stain is wet. Wipe brush often on a lint-free rag to remove excess stain. If applying stain exteriorly, topcoating with an exterior clear finish is strongly recommended. MIXING AND TINTING: Custom colors can be achieved by intermixing colors or by adding up to 10 ounces of universal or industrial colorant per gallon. The amount of colorant added may affect its performance and extend dry time. To lighten Gel Stain, mix any proportion with Natural Gel Stain. Stir for uniform consistency. DO NOT THIN. COVERAGE: Approximately 1,000 to 1,200 square feet per gallon. If the wood is finely sanded or nonporous, coverage is approximately 800 to 1,600 square feet per gallon. If the surface is porous, coverage is approximately 300 to 500 square feet per gallon. Coverage will vary significantly depending on application method and condition of wood. CLEAN UP: Using a cleaning solvent, such as paint thinner or mineral spirits, is recommended for cleanup. The use of paint thinners or mineral spirits may violate VOC compliancy in your area. Check with your local government agencies to ensure proper compliancy. To avoid spontaneous combustion during temporary storage, soak soiled rags and waste imme- diately after use in a water-filled, closed metal container. RECOMMENDED FINISH COAT: We recommend Old Masters® clear finishes. However, this stain can be topcoated with most clears. If a lacquer topcoat is desired, test for compatibility before using. For exterior use, we suggest Old Masters® Spar-Marine Varnish or Exterior Water-Based Spar-Urethane. When applying water-based finishes, allow a minimum of 24 hours before topcoating.